The animation is very good, the attention to detail is amazing. There is no real plot. 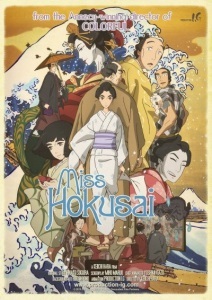 This is a really neat movie, and is an actual biopic of Katsushika Ōi. I don't remember how I even stumbled on it. It's based on a manga series. I saw this a while ago, so some of my memories on the details are a bit weak, but it really is a fine film. It's built more around a series of thematically connected events in the life and myth of Katsushika O-Ei and her father that almost work as separate stories in themselves, feeling a bit as if there was perhaps some thought of an anime series in mind. The "episodes" taken together build a sense of life feeding into art as much as a glimpse of the lives themselves. At the end there is less a feeling of summary understanding wrapping everything up, then an open sense of there being some continuance to their existence and perspectives. The tone is hard to pin down for that reason. It is a bit distanced, strongly felt but still observational in the way of an artist. I'd recommend it to anyone who is drawn to the subject, so to speak.